Bhimtal in Uttarakhand has a long historical background originating in the mythological event of Mahabharata. Bhimtal tourism is boosted by its places of historical importance and the incredible lakes. The city and lake is named after the mighty character Bhima. It is said that the Pandavas of the mythological legend stayed at this place near the most popular and serene Bhimtal Lake. Budget resorts in Bhimtal accommodate thousands of tourists visiting this place every year. Bhimtal has a great tourist potential enveloped in its natural beauty, rivers, lakes, and temples. This destination is visited by leisure tourists as well as pilgrims visiting nearby places of religious importance. Near the Bhimeshwar temple there is a small hill known as Garg Parvat which is visited by many pilgrims. Just two km from Bhimtal is Nal Damayanti Lake, which has a mention in the popular historic story of Nal and Damayanti. Just five km from Bhimtal is the bunch of lakes called Sattal, offering Panoramic views of the surroundings. The lakes are surrounded by thick forests inviting exotic bird life of the region. The crystal clear water of lakes, chirping of birds and tranquil atmosphere resembles the place to a paradise. There is a hill near the lake called Hidimba, named after the demon king mentioned in Mahabharata. Another nearby hill is named as Karkotaka, a cobra mentioned in the Mythological legends. Nag temple on the hill is worshipped by devotees from surrounding region and on every Rishi Panchami thousands of devotees visit this temple and worship Nag Karkotaka. This temple is one of the popular temples in Uttarakhand state. Climate of Bhimtal is Salubrious during summers but winters are cool and sometimes chilling. Bhimtal is a central location for pilgrims and tourists and from here many excursions are available to nearby tourist attractions. At just thirty five km is the ancient temple Mukteshwar Dham, Corbett National Park which is India’s oldest National Park is located at eighty one km from Bhimtal. This Park has around five hundred species of plants and a wide variety of rare and distinct animals. Nineteen km from Bhimtal is Naukuchia Tal a cluster of nine beautiful lakes. We promise an enchanting stay facilitated with charm, luxury and many modern amenities at our United-21 resort in Bhimtal. The location of resort offers picturesque views of the lake and surrounding flora and fauna. Experience a relaxing and rejuvenating vacation at our resort which is located at Village Thapalia Maharagaon, in Naukuchiyatal. The resort is easily accessible from both Nainital and Bhimtal. Bhimtal is 22 Kms. from Nainital and 11 Kms. from Bhowali at an altitude of 1370 mts. The pride of Bhimtal is a beautiful lake which offers magnificent vistas for tourists. The lake is larger than Naini lake. Tourist enjoys here boating in lake.In Bhimtal United-21 offers luxury resorts in cheapest cost. Holi festival in North India is the most predominant festival of which is celebrated with lots of enthusiasm and fun. Bhimtal has a great traditional and cultural background and the most alluring tourist attraction, Bhimtal Lake. Bhimtal the most favored destination located just twenty two km from Nainital celebrates holi in the most traditional manner. History of Holi is encompassed in the mythological legends. Bhimtal is administered by the Kumaon administrative division and the festivals in this destination are celebrated in the Kumaoni style. Variety of Kumaoni Holi recipes is prepared during the feast. Tourists visiting Bhimtal during Holi festival can witness a purely cultural and traditional saga of celebrations symbolizing the victory of good over the evil spirits. A perfectly cultural feast depicting the end of the winter season and beginning of sowing season holds lots of importance in this mostly agricultural community of the Himalayas. Cultural traditions of North are perfectly blended with the local Kumaoni trends. In many Indian states holi is celebrated by arranging logs in a particular style on a circular pit made especially for the celebrations. Then tree branches and dry leaves are placed on the logs and at a particular time this bonfire is set on fire indicating the destruction of the evil. Tourists visiting Bhimtal can witness a totally different type of Holi celebration which is adorned by music and traditional songs. The type of Holi celebrations in the Kumoni region includes Mahila Holi, Baithki Holi and Mahila Holi. In the Bhimtal region mostly Baithki Holi is celebrated which is also known as Nirvan ki Holi. This type of Holi includes reciting of songs which have a touch of spiritualism, melody and fun. Professional singers having knowledge of classical ragas sing these songs. The festive celebrations are inaugurated from the temples and then they are enjoyed in the nearby villages. Hordes of tourists visit Bhimtal throughout the year and Bhimtal accommodations ranging from hotels to the incredible budget resorts in Bhimtal are ready to welcome this inflow. Uttarakhand Tourism is supposed to be the crown of Indian tourism industry, welcoming you to Dev Bhoomi or the “Land of Gods”. This Indian state is abode of the gods, with most ancient and prime temples of Hindu religion nestled on its hills and the plains. Visit this land of marvels and you will realize the mystique enveloped in this land of great cultural and religious inheritance. Bhimtal Lake and Resort is the paradise and one of the major attractions of this sacred region. 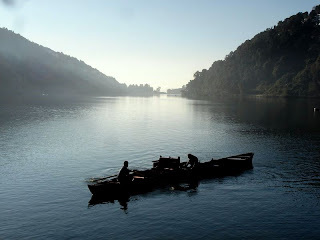 Bhimtal Lake is the place brimmed with Himalayan beauty inviting leisure tourist and adventure lovers to come and spend some incredible time in woods of the surrounding mountains. This lake located in Bhimtal town is the largest natural lake offering splendid views of its surroundings and a cheering stay in the close vicinity of nature. This hill station offers pleasant summers with salubrious climate. Adventure lovers can visit Bhimtal during winters, when the area is covered with snow offering possibility of viewing beautiful migratory Himalayan birds. 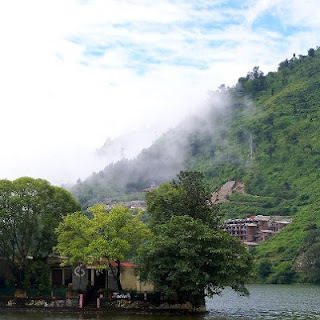 Bhimtal resort is surrounded by many other beautiful lakes like Nal Damayanti tal and sattal a blissful place to spend a few hours in the lap of nature listening to the exotic whistles of birds. Other places to visit near Bhimtal are the Hidimba Parvat where a monk has created a protected area for wild animals known as Vankhandi Ashram. Nainital is the most revered attraction of Uttaranchal Tourism, which is many times referred to as the lake city. As per mythological legends this is the lake of three sages or Tri Rishi Sarovar. The incredible lake of Nainital surrounded by a cluster of dense forests is mesmerizing the minds of tourists visiting this beautiful destination. Mussoorie resorts are other tourist places in Uttarakhand, which are not to be missed destinations during your tour of this invigorating state. Whenever visiting the marvels of Uttarakhand tourism like Bhimtal Lake and Nainital Lake, you can stay comfortably at our United-21 resort in Bhimtal. It is located at a convenient location providing many modern facilities.